We receive comments on a frequent basis from the 3 paintings we have within our office. Todd's art is absolutely stunning and is a great addition to our automotive business. I saw your great paintings at the Fair! Do you have any for sale? Those three were all really good. I live north of Whitewater about 10 miles. Would you have any for the Saco Fun Days? This painting entitled "A Blanket of Roses" by Saco artist Todd Mandeville has been accepted into the International Artists Competition and Exhibition. 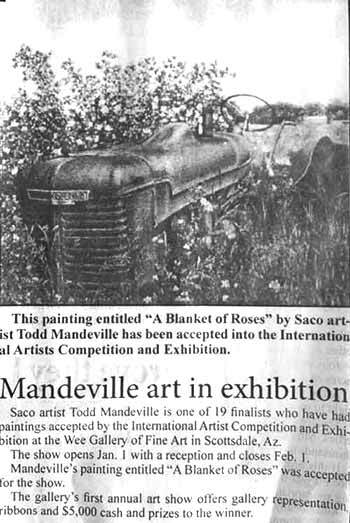 Saco artist Todd Mandeville has earned fifth place with his painting "A Blanket of Roses" at the International Artist Competition and Exhibition held at the Wee Gallery of Fine Art in Scottsdale, Arizona.